Aquincum Mithraeum (of Victorinus) – Mithraeum. Our Common Sun. Mithraeum of Victorinus, Aquincum. From the west. — Photo: A. Pegler. Located within the town house of the decurio Marcus Antonius Victorinus. Orientation N-S. 7m x 16m The shrine is divided up into three parts- two ante rooms (the front room is potualted by the excavators as a Shrine of Mercury. Certainly a large statue base stood here) and the cella trichora with its central aisle about 2 feet below ground level. The benches were accessed by a single step on either side of the bottom of the two cella entrance steps. A fragment of the tauroctony was found in the excavations and would have stood on the large stone base at the end (south) wall of the cella. Within the cella a pair of small altars stood recessed into the front of each podium all dedicated by Marcus Antoninus Victorinus, a city councillor. An altar depicting Mithras being born from the rock was discovered in the excavations. Visible remains: Shrine fully excavated, though heavily restored for display. 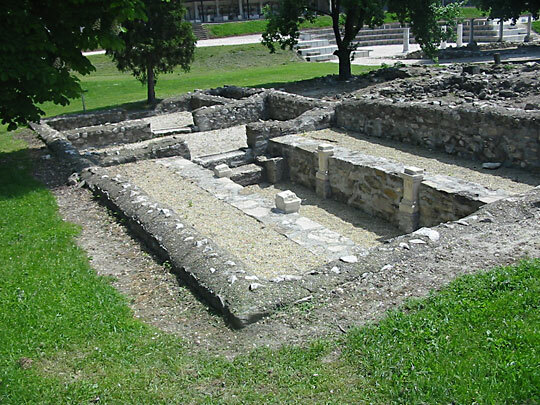 The shrine is fully accessible within the Aquincum Archaeological Park, just south of the Aquincum Museum building. The remains have been heavily restored and consolidated for display. The tauroctony fragment and the altar are located in the eastern wing of the Lapidarium situated at the northern edge of the Archaeological Park. The Victorinus altars are the originals in situ.